Vice President Prof. Yemi Osinbajo, SAN, has said some of the past polices and planning including budgeting of government did not reflect the needs and the conditions of the majority of the people in Nigeria who have become disempowered in the process. Speaking at a courtesy visit by members of the Alumni Association of the National Institute for Policy and Strategic Studies (NIPPS), at the State House, the Vice President said the important thing now is how policies could address the need of the people. “This is the main challenge”, he noted. He observed that some past planning, policy formulation and budgets were not accountable to the people, stressing that in the past there have been “policies that don’t seem to have solutions that truly reflect the understanding of the question of poverty in Nigeria.” He challenged the notion that a country can be described as rich when about two-thirds of its people are extremely poor. 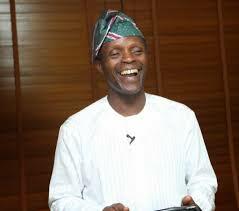 While expressing concern about extreme poverty in the country, Osinbajo restated that records have shown that we have 110 million poor people, representing two third of the Nigerian population, who he said have become disempowered based on the kind of policy formulation that has been going on in the past. Prof. Osinbajo further stated that one of the challenges of policy formulation is how to speak to the people and how to address their plight, adding that the people are concerned about “how do I get a meal, how do I get healthcare and how to send children to school.” However, he said when you look at the budgets it does not often address the needs of the people. The Vice President then challenged members of the Alumni Association to discuss how policy formulation ought to have root in the conditions of the people. “I want the Institute to think about this”, the VP said. Vice President Osinbajo welcomed the idea of a Policy Rountable proposed to him by members of the Alumni Association, noting that what has been lacking in government is a time to think, reflect and consider policy while still working at a fast pace day by day. The policy roundtable is intended to provide an interface between policy experts and makers on a governmental platform on how to address the needs and improve the living conditions of the citizens through policy formulation. Earlier, the President of the Alumni Association, Major-General Lawrence Onoja, Rtd, expressed appreciation for President Muhammadu Buhari’s determination to fight corruption and reposition the economy. He pledged the support of the Association for the actualization of what he called the Three-Point Agenda – Security, Corruption and Economy of the Buhari Administration. Onoja urged the Administration not to only conduct a forensic audit of the government agencies but should jail all those found guilty of looting the country and seize the looted assets as well.